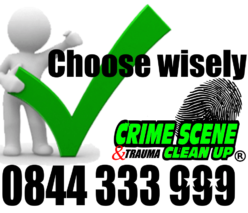 Please can you tell me if it is really necessary to get a crime scene cleaned by professionals? Can we not just get someone willing to do this for us? Dear Cindy, the problem with getting someone willing is that people at this stage are willing to do almost anything for a few extra Rands which is totally understandable. The problem is that will the scene be truly clean and not just appear clean? The reason why I ask this is because normal household chemicals cannot remove and decontaminate hazardous bacteria in someones body fluid and blood. Yes, they will be able to remove visible traces but not the harmful elements. Please also remember that the physiological burden that will be placed on that person will not just go away. The trauma experienced from cleaning a crime scene may only show up a couple of days later. Adrenalin plays a big part in doing something like this. We do not recommend that you use just anyone that is willing to do this as you are putting your own families and the families of the person cleaning the scene at risk. Choose wisely!